Happy Friday folks! I have 2 cards to share with you today that were recently on the Paper Smooches blog:) My first card uses a technique that I've used lots of times in the past, stacked stamping! [For those of you who are not familiar with this technique, here's a tutorial] Usually stacked stamping can be a bit tricky since you have to stamp the same set of images twice. This is especially tricky with multiple colors. But this time I had the help of my MISTI (check out this post here for thoughts on the MISTI). I stamped the butterflies twice onto 2 separate panels and then cut out the Happy Birthday die from one of the panels. Then I attached the die cut word over the other stamped panel using foam tape. Here's a tip for you, do not weed your die cut word completely. If you keep the pieces inside the open spaces and loops, it makes it much more easy to place foam tape on the back of the word die. Fun right? 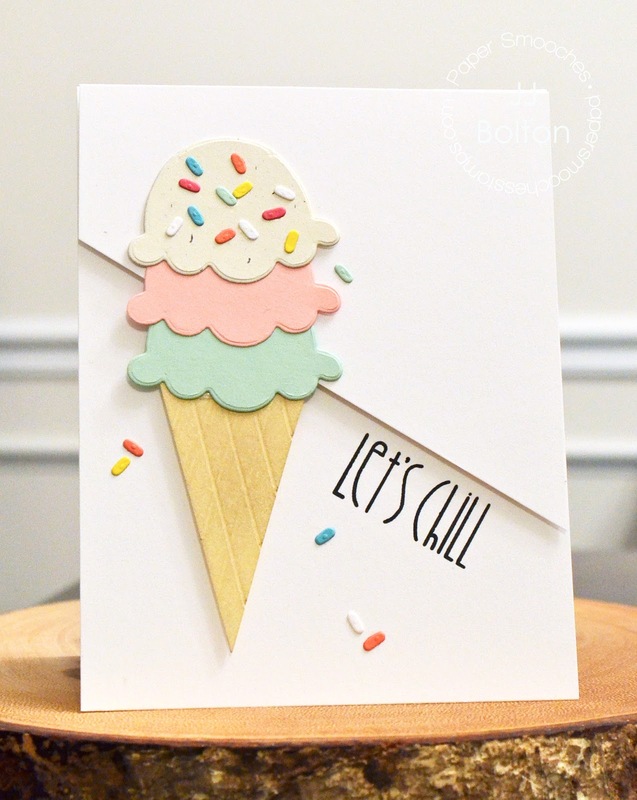 For this next card, I used the Mini Cupcake dies to create this pastel, triple scoop ice cream cone! Not that I don't love a cupcake, but who doesn't love ice cream;) The cone was just made from a triangle piece of card stock that I scored for that waffle cone look. Aren't those sprinkles so cute? I hope you enjoyed the cards today! I hope you have a wonderful day and weekend! I love the clever way you played with your dies, JJ! Both cards are so pretty, too...beautiful color combos and stunning designs! I love that birthday die, I need it! And loving the ice cream cone, yum! Love them...your first card is beautiful...love how you've inked up the sentiment and the 2nd one...delish! Great stacked stamping....thanks for the links. Great cards. 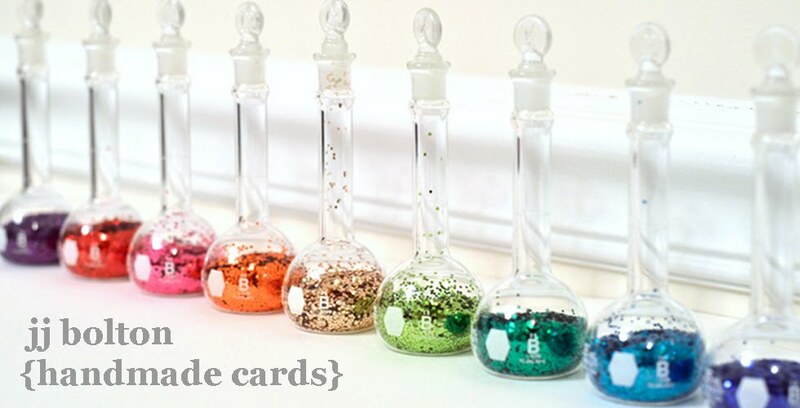 Thanks for sharing your lovely cards and the tips on the MISTI use. Also good to remember the use of the inside die cut pieces. 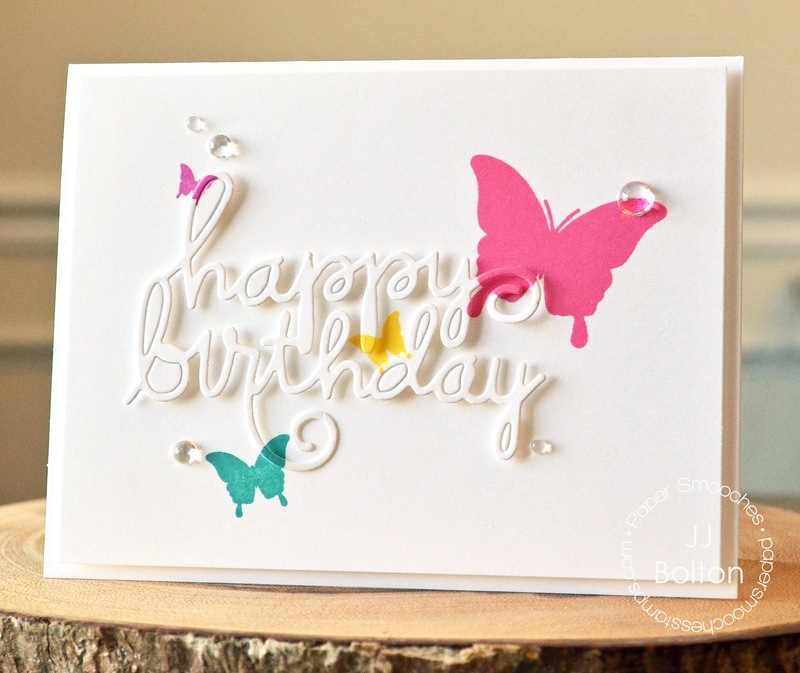 Love the white with touches of colors on your butterfly card, very pretty. Darling use of the cup cakes to make an ice cream cone. Get Your Wax On: Laminated Wax "Paper"